The German intelligence service recently reported many clandestine Iranian attempts to obtain dual-use chemical, biological and nuclear technology. In the Iran nuclear deal, the parties decided to engage "in different areas of civil nuclear co-operation," including construction and modernization of Iranian light water reactors, provision of technical assistance and on-the-job training. Meanwhile, Israel has been denied a bilateral nuclear cooperation agreement with the US. Israel's reported MOU requests on security assistance, missile defense, and regional qualitative military advantage are justified. The terms of any U.S.-Israel agreement must withstand comparison to the concessions offered Iran in the JCPOA and show unequivocally that Israel, a trusted ally and major strategic partner, fared better in negotiations than an unconstrained enemy. The one-year anniversary of the signing of the Joint Comprehensive Plan of Action (JCPOA) between Western powers and Iran focused public attention on the regime's activities and Obama Administration policies and actions regarding this avowed enemy. Virtually unnoticed, despite the linkage to Iran-related developments, were reports that Israeli Prime Minister Netanyahu is being pressured to set aside reservations and accept the terms the White House is offering for the Memorandum of Understanding with the U.S.
As recent developments show, such an acquiescence would be mistake. There is cause for concern. Iran continues to take Americans and other Westerners hostage, indicting three dual-nationals just days ago on unknown charges. This remains a troubling pattern of diplomatic blackmail, negotiation by coercion. Last month in Lebanon, a so-called parliamentarian for Hezbollah, a terrorist surrogate of the Iranian regime, called for "Israeli civilians to be kidnapped in a future war with Israel." He "boasted" that Hezbollah's missiles "can now reach Tel Aviv from Iran, not just Damascus, Beirut, or Cairo." The German intelligence service recently reported on numerous Iranian attempts to clandestinely obtain dual-use chemical, biological and nuclear technology. The report by the Bundesamt für Verfassungsschutz (BfV), the domestic intelligence service of the Federal Republic of Germany, also noted "a further increase in the already considerable procurement efforts in connection with Iran's ambitious missile technology program, which could, among other things, potentially serve to deliver nuclear weapons." 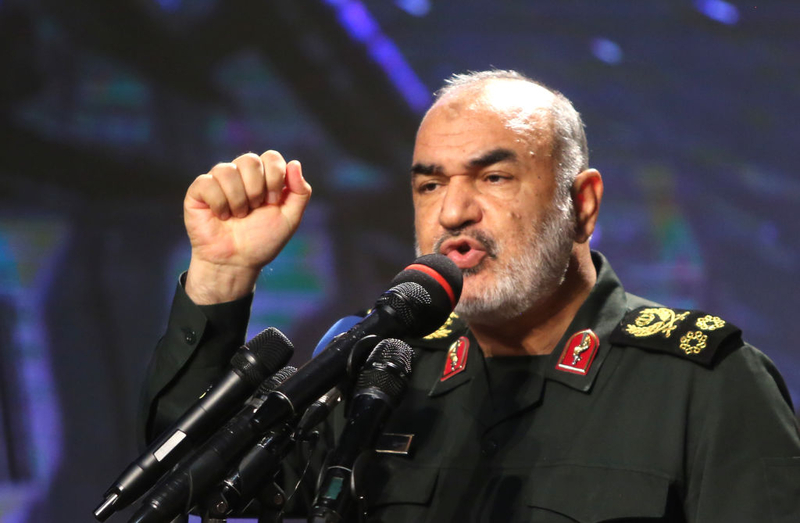 In early May, the Deputy Chief of Staff of the Iranian Armed Forces, Brigadier General Ali Abdollahi, reportedly revealed at a conference in Tehran that the regime had test-fired a high-precision ballistic missile "with a range of 2000 kilometers and pinpoint accuracy of 8 meters." In March, Iran's Islamic Revolutionary Guard Corps (IRGC) launched two Qadr medium-range ballistic missiles. On one of them, in Hebrew, was inscribed the phrase, "Israel must be wiped out." Iran's Deputy Foreign Minister recently said, in response to the U.N. Secretary General's statement that Iran's ballistic missile tests are "not consistent" with the "spirit" of the multilateral nuclear agreement: "We will severely confront any move -- be it political, legal, or technical -- that hinders our missile program." Also recently, U.S. Department of Energy officials confirmed the purchase from Iran of nuclear materials. Congress voted to block such transactions but as media reports indicate that the purchase, amounting to $8.6 million in taxpayer funds, was conducted in April, the vote was to no avail. More surprises could be in the offing. An oft-overlooked benefit in the JCPOA can be found in Annex III, where the parties decided to engage "in different areas of civil nuclear co-operation," including construction and modernization of Iranian light water reactors, provision of technical assistance and on-the-job training. Meanwhile, Israel has been denied a bilateral nuclear cooperation agreement with the U.S. Some argue that, in light of the security challenges posed by Iran as well as other state and non-state actors, Israel should accept whatever the U.S. offers in the Memorandum of Understanding (MOU). This acceptance would be a mistake. A close ally -- the only democracy in the Middle East -- and a much needed partner in U.S. efforts to combat regional and global threats, Israel must not be turned into a beggar, particularly when Obama Administration policies have, arguably, contributed to an escalation of the dangers Israel faces. Consider the billions in previously frozen assets released to Iran under the nuclear agreement. As least some of it, by Secretary of State Kerry's own admission, will fall into the hands of the IRGC and other Iranian entities, affiliates, and surrogates designated as terrorists and terrorist-enablers. A separate $1.7 billion the U.S. Treasury transferred to the Central Bank of Iran in January of this year, as Tehran released Americans it had unjustly held captive for years, will be used to fund Iran's military expansion. For these and many other reasons, Israel's reported MOU requests on security assistance, missile defense, and regional qualitative military advantage are justified. Israel is a major strategic partner, as declared in the United States-Israel Strategic Partnership Act, enacted on December 19, 2014. The new law laid the foundation for expanded bilateral cooperation in a wide variety of spheres including defense, intelligence, and homeland- and cyber-security. Among other provisions, it enhanced "Israel's trade status to expedite export licensing" for certain defense-related technologies and products, and expanded "authority for forward-deployed U.S. weapons stockpiles in the Jewish State." Israel is also a major non-NATO ally and, in May of this year, was granted permission by the North Atlantic Council to open a diplomatic mission at NATO headquarters in Brussels. Perhaps it is time to fill the void in the security relationship with the Jewish State, elevate the discussions beyond an MOU, and consider a more fulsome security arrangement -- one that is comparable to those with such trusted allies as the United Kingdom and Australia. The Congress should lead the way, as the Obama Administration does not have "clean hands". A newly released Senate Subcommittee report explains how the State Department awarded hundreds of thousands of dollars in government grants to an Israeli organization that used the funds to mount a campaign against Prime Minister Netanyahu in the 2015 parliamentary elections. President Obama once even questioned the necessity of maintaining Israel's qualitative military edge. Ultimately, the terms of any U.S.-Israel agreement must withstand comparison to the concessions offered Iran in the JCPOA and show unequivocally that Israel, a trusted ally and major strategic partner, fared better in negotiations than an unconstrained enemy. Yleem D.S. Poblete, Ph.D. is a Fellow at the Institute for Policy Research at the Catholic University of America. She served for close to 20 years on the staff of the Committee on Foreign Affairs, U.S. House of Representatives, including as Chief of Staff. During her tenure, she was responsible for such consequential measures as the Iran Threat Reduction and Syria Human Rights Act of 2012, the Palestinian Anti-Terrorism Act of 2006, and the 2007 MOU with Israel. Related Topics: Iran, Israel receive the latest by email: subscribe to the free gatestone institute mailing list.